In its first year, UpRound hosted Silicon Valley investor Mark Kvamme as part of its educational speaker series. A new student org at the University of Michigan wants to build new connections for the startups in southeast Michigan and give undergrads a look into the world of venture capital along the way. Called UpRound VC and co-founded by CS undergrad Jonah Erlich, the group works with national and local firms to accelerate the entrepreneurial ecosystem of the region. For an organization just over a year old, UpRound has already undergone significant evolution. The idea for a student org about venture capital began when Erlich and five other students attended a VC competition at Carnegie Mellon. The U-M team, comprised of three men and three women from a variety of majors, took an unexpected first place against the competitors, almost entirely men and business majors. “We realized that the reason we won was our diversity both in the traditional sense as well as in the academic sense,” says Erlich. The idea was born to create a multi-disciplinary space for students interested in venture capital and entrepreneurship, representing students from across the university. 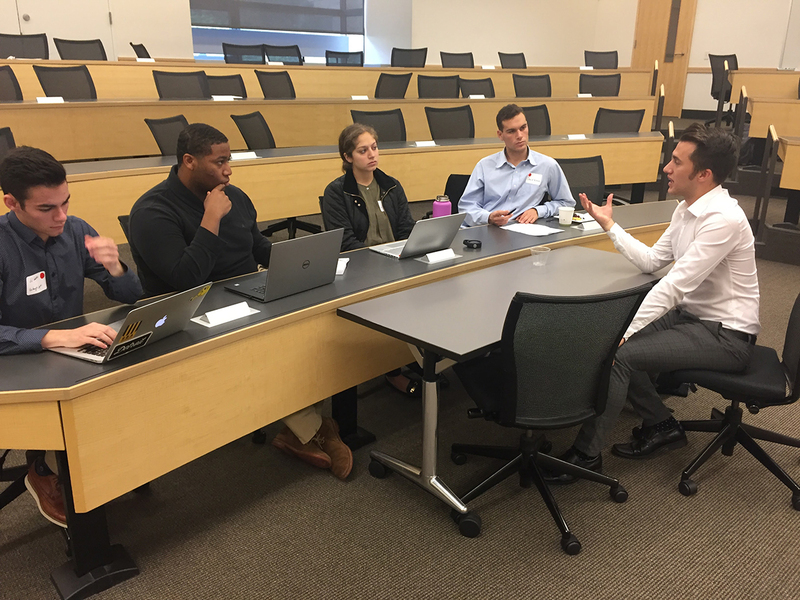 The group began with a focus on creating weekly educational events and an undergraduate VC competition open to U-M teams. For the latter, UpRound partnered with the Zell Lurie Institute to take over a smaller event from previous years. The group was able to increase applications to the competition by 2000%, and brought in VCs from San Francisco, New York, Chicago, and Detroit representing $5 billion of assets to act as judges. Students meet with an alum at UpRound's VC competition. L-R: JJ Wachler, Chris Scott, Chaghig Demirjian, David Kobrosky, and U-M alum Michael Copley. Before the competition, UpRound gave the investors a presentation on the entrepreneurial activity taking root all over Detroit and Ann Arbor, just as U-M startup Duo Security became the first from the university to reach “unicorn” status – a total valuation of $1 billion. 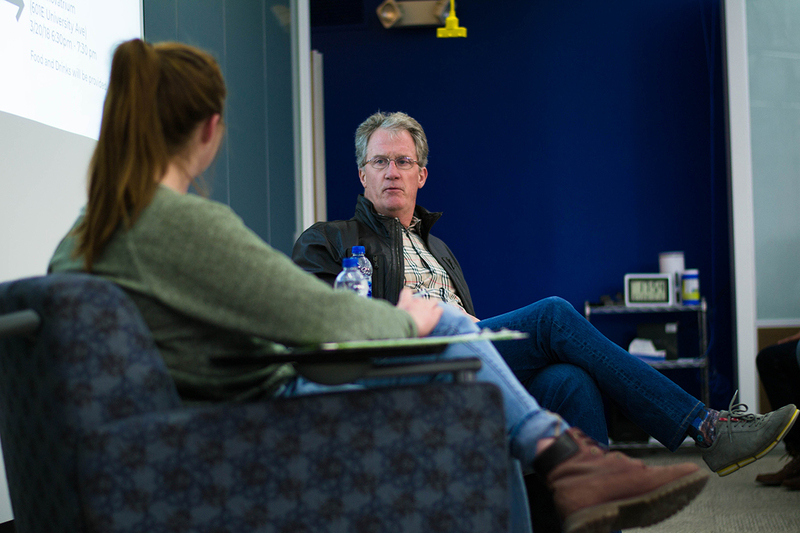 Later in the year, the team brought in Mark Kvamme as part of its featured speaker series. Kvamme, a former partner at Sequoia Capital in Silicon Valley and an early investor in LinkedIn, founded a $250 million fund in Columbus, Ohio and serves on the board of three Ann Arbor companies. Ultimately, Erlich and other leadership felt that the org’s offerings in its first year weren’t getting enough engagement for the amount of time and effort they demanded. They decided UpRound needed a clearer goal and means to get there. “This semester we’re working on focusing and getting more output from the things we do really well,” says Erlich. Now, with plans for more focused efforts, UpRound’s 23 organizers have settled in to their vision of offering interdisciplinary undergraduate venture capital education and engaging the broader venture community with Southeastern Michigan. The group’s biggest push is building connections with VCs and firms around the country to help with the very early stage deal-flow of local startups in Ann Arbor and Detroit. They work with any companies that can benefit, including many within the university ecosystem and its accelerators and incubators. So far, they’ve built connections with Rock Ventures and GBeta, two firms in Detroit that will work with the local community outside of their portfolios, as well as a number of individual investors. How does the team do it? According to Erlich, he just has to say the magic word. Erlich, coming from a family full of business founders himself, hopes to see everyone involved get the most out of the group’s efforts and build productive, lasting connections. With UpRound’s help, southeast Michigan business may have a bright future. Read more at Michigan Daily.